Google Alerts: Receive email alerts whenever your salon gets mentioned on the web. Social Management: Tools such as HootSuite allow you to track & respond to all your mentions from multiple platforms in one place. Branded Hashtags: Use these through Twitter, Instagram, and Facebook, to help your brand stand out and track mentions. Better Business Bureau: Consumers look to the BBB for credibility, so set up a profile to monitor coverage of your business, and build trust. Moderation: Consumers visit sites like Yelp to learn about others’ experiences. Respond to comments quickly to ensure accurate information. Community Manager: Having a face on social media can personalize your brand & ensure issue resolution. 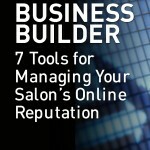 Monitor Competitors: Check out other salons’ activity—noting successes & failures—to help you refine your own approach. *Source: Search Engine Land “Local Search Marketers: 83% of SEOs Believe Focusing on Reviews Delivers Good ROI”. May 4, 2015. Do Your Clients Expect Convenience? Then Offer Online Gift Certificates and Increase Revenue Today!